Flashes of Style: Blowfish 'Gimmik' Platforms Giveaway! 1.) Leave your name and e-mail in a comment below. This giveaway is open to U.S. and international readers. Stay tuned for the contest end date. Good luck! wearing: Dress courtesy of wholesaledress.net; f21 skirt; Xhiliration cardigan; bag via e-bay; necklace courtesy of les jumelles; 'Gimmik' platforms courtesy of Blowfish. I'm following on google, but am not a memeber of bloglovin, hope I can still enter. Oh my goodness, Bonnie! I love this outfit. That collar is the perfect touch. oh they look so amazing!!! i follow you on google!! Oh how cute are those shoes! I have been looking for a pair of platforms this spring! I just followed you with google but I already follow you on bloglovin. i love that sailor top, and the socks w heels... to die for. i want to use you for the next bloggers i heart! i am going to email you this week about it :) bc i seriously heart you! They look really confy :) I want one pair! since i'm following you anyway because i think you and your outfits are lovely, i'm totally in to win those amazing pair of shoes. Oooh, sign me up! I'm a google and bloglovin' follower. Omg, I would do anything to have these amazing shoes! I would LOVE to win this, those shoes are amazing! These platforms look so perfect with socks! Enter me please? following you on google and bloglovin'! I can't tell you how many times I have visited their website looking at their shoes. Too many! Ha. I've been eyeing these for awhile now!! I really really really would like them pretty please? I follow you on both. yay! it's open to international readers! I am following on Twitter, Bloglovin and GFC...fingers crossed! lovely outfit! and where did you get this ring? loving the shoes too!!! I follow you via bloglovin and google! they are sweet shoes and that is so nice they gave you a pair too! I love this outfit on you. always so amazing in how you dress. 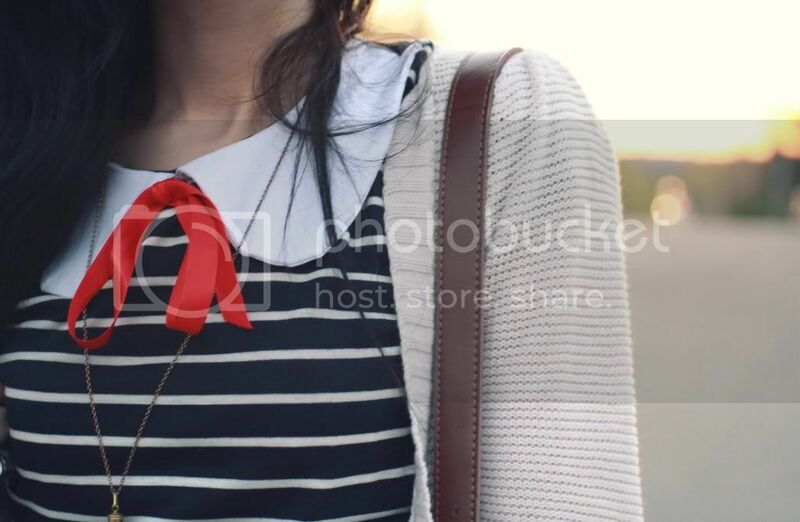 love the bow ribbon, so cute! What a good idea, I should try layering some dresses under skirts. OH to the EM to the GEE! I need these platforms! I love them so much, and especially the way you wear them! I will be crossing my fingers dearly for them! You know I've always followed you girl! I keep seeing these cute shoes popping up in random places, and I love it!! theyre soooo lovely! especially with socks! this would be amazing to own! I'm following you on google and bloglovin! - Leah W.
your outfits are...love! so inspiring :) and if i can have your same shoes...well i'll try! You are looking so beautiful! I love those shoes so much so much it's crazy. They are so so pretty :) And I also love your navy outfit ! This is such a lovely giveaway :) I already follow you on both accounts! I'd love a brown pair! Hope you're okay Bonnie and enjoying the first Spring days, you look perfect! Following on Google and Bloglovin. Such a fun giveaway! Blowfish is my favorite shoe brand, so definitely trying! I spied this little guys on Polyvore not too long ago and I posted an blog entry about how much I loved them. This platforms are the best. even if I dont win, I definitely see myself owning these glorious sandals. Oh, those are so darling; I want! your sailor shirt is so adorbale! love it love it. Love your outfit and those shoes are to die for! The outfit is gorgeous by the way! And I follow you on Google, but I don't have a Blog Lovin account, hope I can still enter. Ugh, I've been wanting these shoes so bad! What a great give away! i'm following on google friend connect and blogger. Amazing fashion taste and adore the shoes. 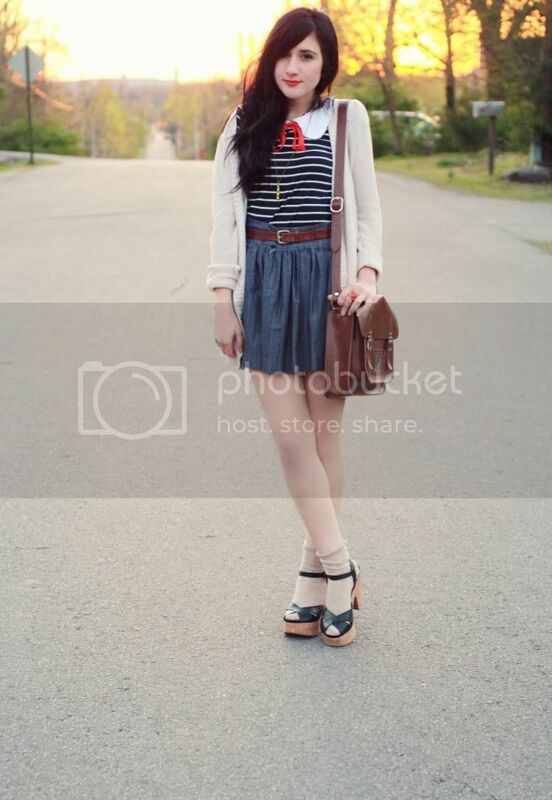 Following on google and bloglovin :) I am actually in <3 with those shoes! i follow you through google and bloglovin!! those shoes are so adorable! I love Blowfish! These are perfect. This outfit is amazing, and so are those shoes! I follow you on Bloglovin! I've been following you on both! I´ve been following you on bloglovin´ for a long time and now, I am floowing you on google too. I follow you on both! 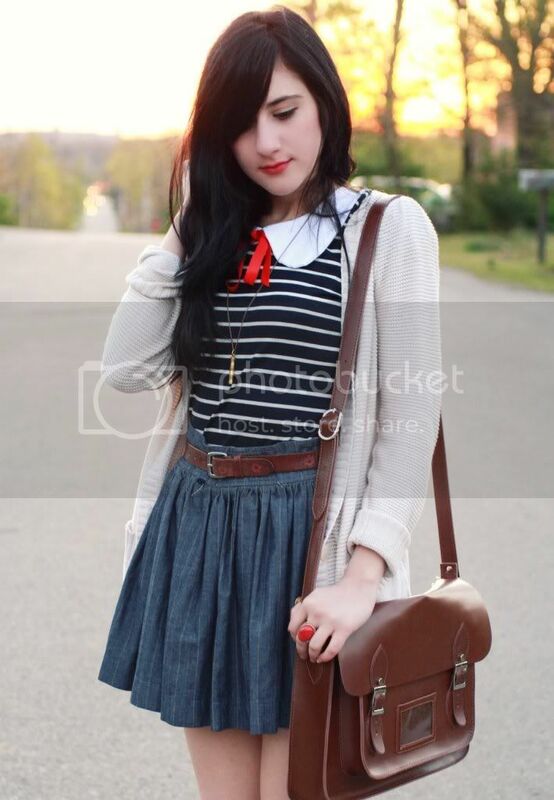 aw this is such a cute outfit, and I loooove those shoes!! Oh they are so cute!!!!! Your outfit is adorable too!! My name is Courtney Clarke and my email is cvc564@mun.ca. I'm from Newfoundland, Canada and I follow your blog all the time! Your style is honestly amazing! Love the jean skirt!! Adorable. so cute- they look great with socks! I need these shoes for when I go to France. Oh my! These are wonderful! Just trying... I might get luck. They are pretty! I follow you on google, you always look so delightful! I really like all the cute peter pan collar shirts you wear! I follow on both...I have had my eye on these shoes for weeks!! lovely outfit! and the shoes are FAB. Those shoes are super sweet!! And yes, I'm a follower (GFC). Crossing fingers and toes!! Eep. Lovely Bonnie :) Thank you for the giveaway girl! and I follow you on both cause I can't get enough! Wishing you well!! <33 Enjoy springtime! ohhh.. you look so cute! I'm now a follower via GFC and Bloglovin. Cute! Love the header of your blog! Walk me into a Spring fling! I already follow you through Google & Bloglovin'. i'm a shoe fiend. please o' please. hihi :) those shoes are so cute! I <3 the bag too!!! I hope I win. Those shoes are so cute and I need a good pair of platforms. I think I've successfully followed with bloglovin! Also lovin your outfit- you are too cute! My name is Olivia and my email is livenova(at)yahoo(dot)com. Here's hoping I'll have some luck! Those are amazing! They really seem comfY1 Great giveaway. Well when I came by I wasn't expecting a giveaway, but since I'm here, please count me in, I'm a follower. Those wedges are sooooooo great and an international giveaway is not easy to find. Fabulous giveaway!! I would love to own a pair of blowfish shoes! Yours look great with your outfit!